Forget Hillary vs. Bernie, or the left-vs.-center splits that have defined their fights for a generation. For Democrats, raging primary battles are less about ideology than they are electability – and what kind of candidates can motivate voters in the age of President Donald Trump. With four red states voting on Tuesday, Democrats’ main problem at the moment isn’t in finding viable contenders so much as it is what to do with too many of them. In Georgia, two 40-something women named Stacey are fighting for the Democratic nomination for governor. Stacey Evans, who is white, is running based on her appeal to moderates and Republicans; Stacey Abrams, who is black, is an unapologetic liberal hoping to boost progressive and minority turnout. In Kentucky, a former fighter pilot, Amy McGrath, faces off with Lexington’s openly gay second-term mayor, Jim Gray, in what Democrats view as a chance to reclaim a House seat in a solidly Republican state. In Texas, two young progressive women are competing for the chance to take a Houston-area district that Hillary Clinton carried two years ago. National Democrats failed to keep one of the women out of this round of voting by pronouncing her “truly disqualified” in a general election. Of course, qualifications are for voters to decide. Inside some compelling candidate backstories are complicated calculations about the Democratic Party’s path back to power. 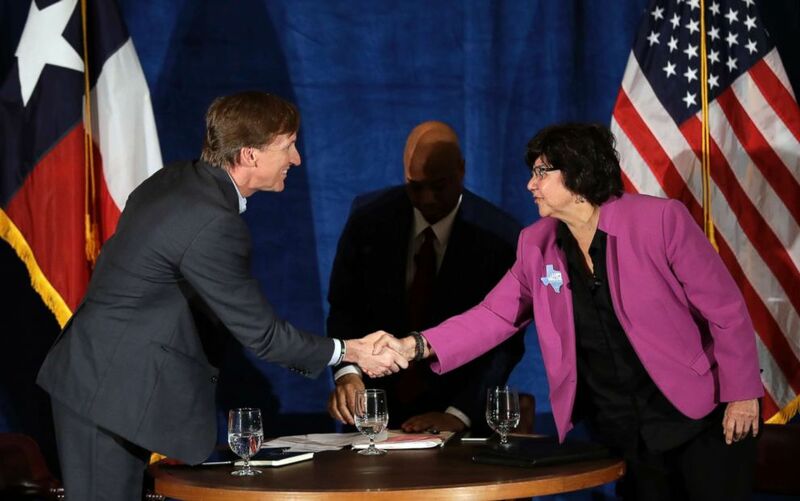 Texas Democratic gubernatorial candidates Andrew White, left, and Lupe Valdez, right, shake hands following their debate, May 11, 2018, in Austin, Texas. Texas Governor Greg Abbott is relatively popular, and probably not near the top of many Democrats’ list of most vulnerable state executives. But in a state that has been marred by abysmally low voter turnout in non-presidential-year elections, a blue wave could make all the difference. Abbott won with 59 percent of the vote four years ago, but it was 59 percent of only 33 percent of registered voters who came out. President Trump won 52 percent of the vote in the Lone Star State. Experts say Texas’s low turnout has been partially due to a perception that few races were actually competitive. This year though, for the first time in 25 years, a Democrat is running in each of the state’s 36 congressional districts. More than a dozen Democratic congressional primaries were so jammed packed they went to the run-offs today. Plus, a Democrat challenging Republican Senator Ted Cruz is surging. All this looks like signs of energy, but enough to switch control of the governor’s mansion too? The choices in today’s Democratic gubernatorial primary runoff: Businessman Andrew White, who is largely seen as moderate (though tough and bold on guns) or former sheriff Lupe Valdez, a gay Latina with a lot of excitement behind her. Valdez has faced serious questions about her handle of the issues. White won the major newspaper endorsements with glowing reviews. Either way, party voters will decide who is best to take advantage of this political climate and take on Abbott in the fall. 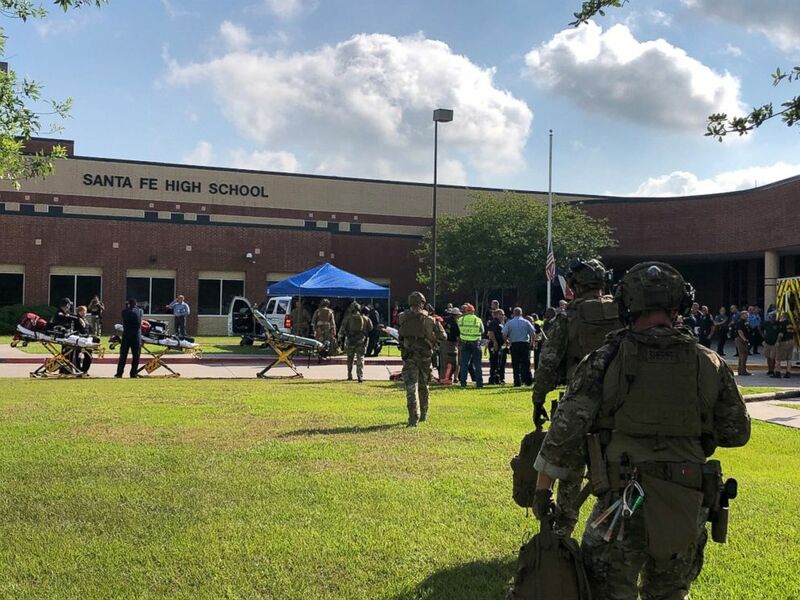 Law enforcement officers are responding to Santa Fe High School following a shooting incident in Santa Fe, Texas, May 18, 2018. One thing to watch in Texas today is how much the recent shooting at Santa Fe High School will drive voters to the polls. About 40 miles away in Houston, the top two Democrats who advanced from the March primary – former journalist Laura Moser and lawyer Lizzie Pannill Fletcher – are facing off in the TX-07 runoff election. Both said they will work to prevent gun violence but political analysts say with early voting, it’s too late for some outraged voters to change their minds about which candidate they believe would get the job done. “More than half of the votes in the runoff have already been cast,” Rice political science professor Mark Jones pointed out. Texas’s 7th Congressional District is one of three Hillary Clinton marginally won in the 2016 election which has led it to be a top target amongst the Democratic Party. Democrats are hoping to flip Rep. John Culberson’s House seat, which the GOP has held for 50 years. While early voter turnout was high leading up to the primary, political analysts are expecting only six percent of registered voters to participate in the runoff. “Most voters are doing two things: they are not voting and those who are voting, are voting early by mail… Average age of a primary voter in the general election is over 60 so when you get to the runoff you’re getting higher ages,” Rice University professor Robert Stein said. “If any of the progressive gun control activists in the Democratic Party start turning out, Moser might see a last-minute surge there,” Stein said. President Trump welcomes the President of the Republic of Korea at 12 p.m. The president delivers remarks at the Susan B. Anthony List 11th Annual Campaign for Life Gala at 7:30 p.m.
Arkansas, Georgia, Kentucky and Texas hold their 2018 primaries. Polls in Arkansas open at 8:30 a.m. and close at 8:30 p.m. EDT; Georgia polls open at 7 a.m. and close at 7 p.m. EDT; Kentucky polls open at 6 a.m. and close at 7 p.m. EDT; and Texas polls open at 8 a.m. and close at 8 p.m. EDT. You can read coverage of the primary action on ABCNews.com or on the ABC News app available on the Apple App Store, Google Play Store, Apple TV App Store, and Roku Channel Store. Don’t forget to sign up for Midterm Elections Alerts to get more coverage of this year’s election season from our powerhouse politics team. Secretary of the Treasury Steven Mnuchin appears before the Senate Appropriations Committee at 10 a.m.
"That he would issue such an absurd and abusive demand based on no evidence shows just how little regard the president has for the rule of law." -- Senate Democratic Leader Chuck Schumer during remarks on the Senate floor on Monday slamming President Trump’s tweets demanding that the Department of Justice investigate its own conduct with Trump campaign officials.